Ok, I’ll admit it, I’m a chocolate-holic. 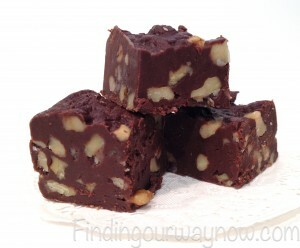 With that said, I thought it highly appropriate to share one of our family’s all time favorites, my Easy Fudge Recipe. 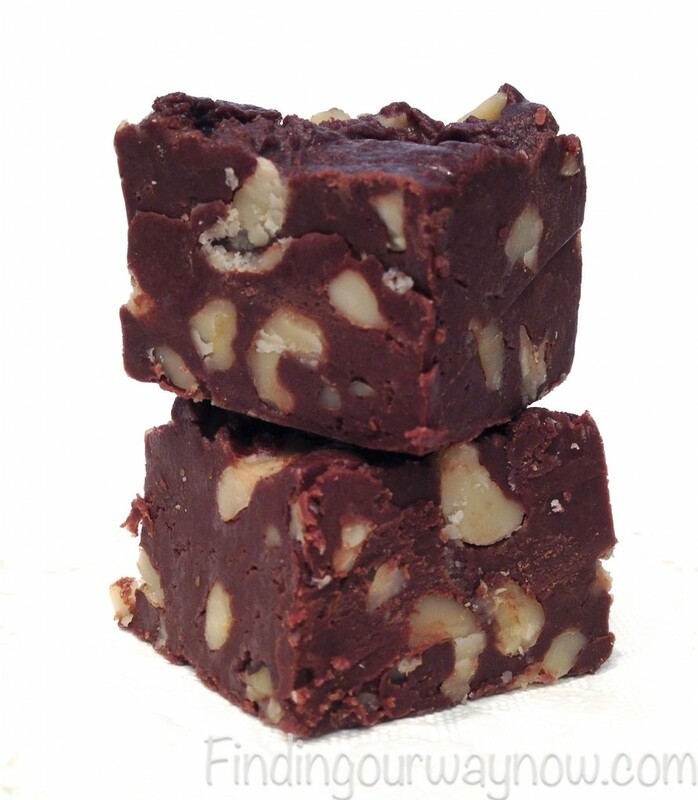 This easy fudge recipe is so simple it defies the myth that fudge is a challenge. If you like fudge, you will love this recipe. It’s one of the first things that will disappear when placed on a dessert table. I found this recipe on the back of an Eagle Brand Sweeten Condensed Milk can a very long time ago. 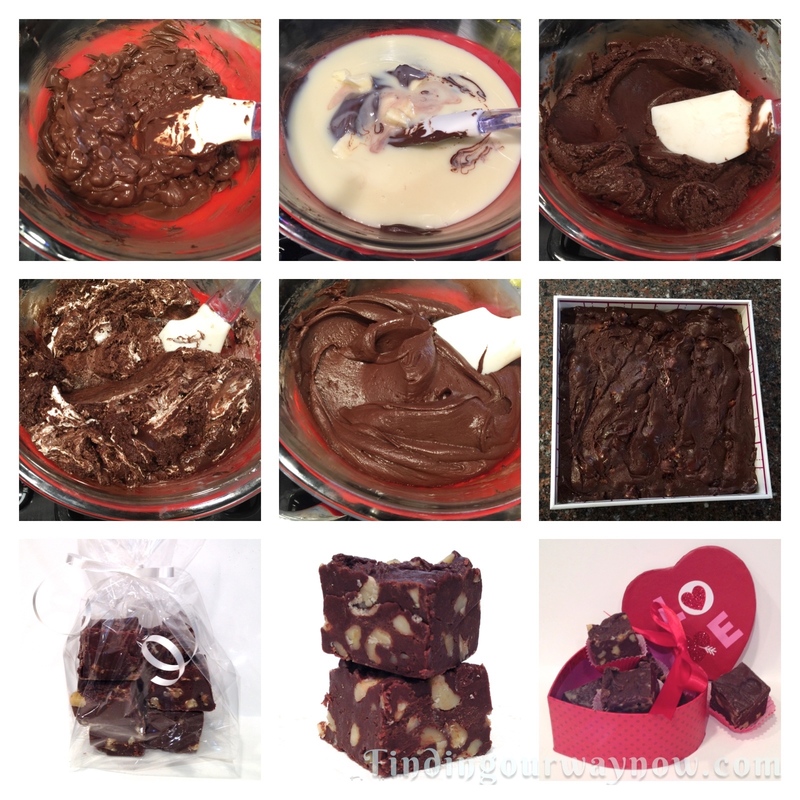 With only a few modifications, this is the easy fudge recipe I now use, all the time. The hardest part of this easy fudge recipe is keeping some for myself when I bring it out to share. Ingredients: Makes around 5 ½ dozen pieces. Line an 8×8-baking pan with parchment or aluminum foil (for easy lifting). Prepare the pan by greasing the parchment or aluminum foil and set aside. Or use a well-oiled Marshmallow pan. Melt the chocolate chips in a double boiler or a heavy saucepan over very low heat. Take your time and be careful not to scorch the baking chips; add the sweetened condensed milk and butter, stirring until well blended. Follow with the vanilla extract and salt. Add the marshmallow cream and stir until thoroughly combined. Follow with the chopped nuts and mix until all the nuts are evenly incorporated. Pour the fudge into the prepared pan and refrigerate until firm. Cut into 1-inch size pieces. Alternative Method: You can use the microwave for this recipe by placing the chocolate chips, sweetened condensed milk, and butter pieces in a large microwaveable bowl. Mix the three ingredients together. Microwave on medium strength until the chocolate just starts to melt, about 3-5 minute. The time will depend on the strength of your microwave. Stir once or twice during cooking. Add the remaining ingredients and mix until everything is completely blended. Pour the mixture into a prepared pan, chill to set and cut into pieces. Notes: My favorite tool for this recipe (and others) is the Marshmallow pan with folding sides. The better the chocolate, the better the outcome so don’t skimp on this ingredient. You can also replace the cup of walnuts with other types of nuts or any a combination of raisins, dried cherries, cranberries or chopped dried fruit. 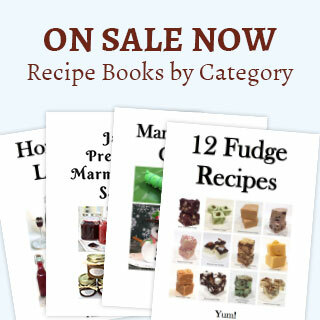 Have fun and experiment to create your own great favorite easy fudge recipe combination. 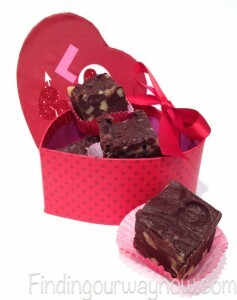 This easy fudge recipe makes a great gift for someone special or anyone who happens to love chocolate. All you need is a cute box, some small cupcake wrappers, and you have a beautiful gift that anyone would love. This fudge is so yummy it won’t last long, so I highly recommend that you make a double batch, to ensure you have some leftovers for yourself. Enjoy. If you enjoyed this Easy Fudge Recipe and you’re looking for other great treats for Valentine’s Day, check out my Easy Dark Chocolate Truffles, Pretzel Pecan Candy Treats, and Homemade Almond Clusters. Enjoy.